Humanitarian activists began their daring steps yesterday to end the war in Aleppo, Syria. 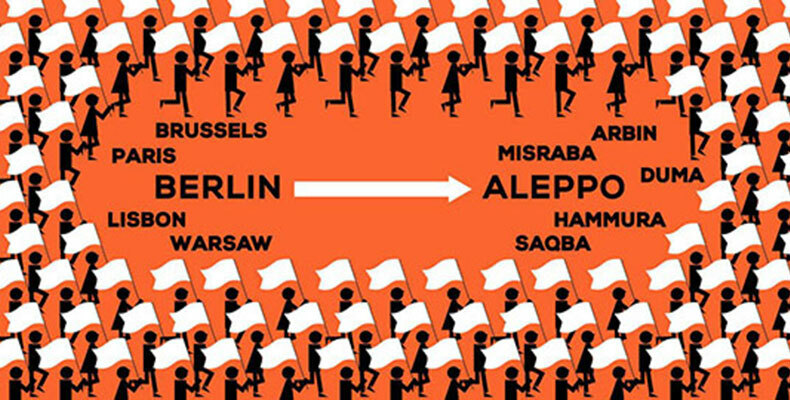 The walk started in Berlin and headed for Aleppo. It is going to be the longest march ever covering a distance of 1,800 miles. [Jakarta, LTTW] Carrying a white flag with “We Are All Human” message on it, the activists demand peace in Aleppo, the rest of Syria, and elsewhere that experiencing war. The group also urges international help for the civilians caught up in life taking conflicts. The number of human casualties in Syria is quite staggering; according to Syrian Observatory for Human Rights recently, the number of children killed has reached almost 16,000, while for women reached 10,500. The United Nations and Arab League Envoy to Syria has estimated the death toll in Syria at 400,000. United Nations High Commissioner for Refugees (UNHCR) reported that 4.6 million Syrians have fled the country, and 6.6 million have been internally displaced, in addition to 1 million who have requested asylum to Europe. This humanitarian march is initiated by Anna Alboth, a Berlin based refugee activist who refuses to stay silent over the killings in Aleppo. The walk itself will journey through Czech Republic, Austria, Slovenia, Croatia, Serbia, Macedonia, Greece and Turkey. If you think that this movement is a noble act, you can give your support through their website: www.gofundme.com/CivilMarchForAleppo. The world has gone conscienceless and irrational; it would take a daring and real action to re-rationalize the minds and heal the inner voice. The more irrational and conscienceless we are, the more dying our humanity will be.